Pulled whitework embroidery stitches can be very effective. In my introduction to pulled thread embroidery I explained that the patterns are created by pulling the fabric threads together with the working thread. This thread is normally the same colour as the fabric, normally white or ecru, as the stitches themselves are not meant to be seen in the finished work. Cobbler stitch is a pretty stitch that is easy to work, creating a pattern that resembles window panes. It is sometimes called a composite stitch as you turn the work halfway through and repeat the procedure at right angles to the original stitching. While you are learning the stitch try to use an openly woven fabric, perhaps 18 threads to the inch, to make things easier for yourself. You may even want to use a pastel coloured thread for your first attempt so that you can see the stitches. Try not to use a dark colour or the pattern won't show up as it should, the eye will be drawn to the stitching instead. Pulled cobbler stitch consists of rows of straight stitches, spaced apart, and crossed by similar rows. Each stitch covers four fabric threads and leaves 3 empty holes underneath the thread. 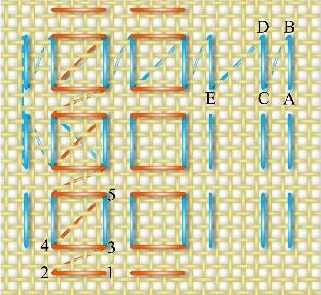 Alternate stitches are worked 2 then 4 threads apart as shown in the diagram, below. Note: The diagram shows how the stitches are placed (for ease in following it), but does not show the displacement of the fabric threads that happens as the work is carried out. Your stitching should resemble the photograph at the top of the page. I also worked a pulled satin stitch border around the area of cobbler stitch in the photograph, which is one of the whitework embroidery stitches covered in my free pulled work lesson. Don't yank hard on the thread as it could break, instead keep a steady but firm tension, using your fingers of your non-dominant hand to keep the pull on the thread while you take the next stitch. Begin by working the (blue) horizontal rows, bringing the needle up at A, down at B, up again at C (missing one hole) and down at D. Come back up at E (4 holes to the left of C) to begin the second set of two stitches. Continue in this manner to complete the horizontal rows. Turn the fabric a quarter turn to the left. Work the second stage in a similar manner, following the numbers (and orange stitches) on the diagram. Remember to pull tightly to allow the "double cross" pattern formed by the fabric threads to show to advantage. 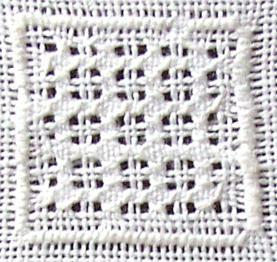 Note: Framed Cross filling, another of the whitework embroidery stitches, is worked in a similar manner, with the stitches four, then one, thread apart with one fabric thread separating the rows.